One of the most common medical conditions that an individual will suffer with at some point is hives, also called urticaria. Some type of allergic reaction often brings on hives. The condition lasts less than six weeks in most cases. Approximately 30% – 40% of patients suffer from what is known as chronic hives or chronic urticaria, which has an autoimmune cause. There are quite a few other causes of hives that most people do not even know about until they have a case of hives. There are many types of hives, and all types of hives are treatable. Nurses will encounter many patient who have hives and will need to know how to provide care for these patients. Hives (also called urticaria) is a condition that causes a noticeable skin rash with itchy, raised, pale red bumps. Hives are the result of allergic triggers in most cases. Other names for hives include welts, nettle rash, wheals, heat rash. There are 2 classifications of hives: acute and chronic. People experience acute hives within minutes of coming in contact with an allergen. The reactions can last from a few hours to a few weeks. Chronic hives lasts 6 weeks of more. The visual appearances of chronic hives are the same as acute hives. Some cases of chronic haves have lasted 20 years or more. Over half of the cases of chronic hives that people experience last one year or more. When the body experiences an allergic reaction, it releases a protein known as histamine. As histamine is released, tiny blood vessels in the body—know as capillaries—leak fluid. As this fluid accumulates beneath the skin, it causes a hives. Drug-Induced – Drugs such as penicillin, aspirin, clotrimazole, suphonylurea, dextramphetamine, and sulfonamides can cause allergic reactions. Anti-diabetic and anti-convulsive drugs can also cause this type of reaction. Drug-induced hives can also affect those suffering from severe cardio-respiratory failure. Stress (Cholinergic) – This type of hives happens during sweat, but can also happen with other hives conditions after sweating and exercising (it is commonly called cholinergic urticaria). It can also happen when people perform activities that warm the body’s core temperature (ex. showers or hot baths). People with this type of hives may experience tingling, itching, heating-up, or burning or the skin. Hives remain for 60 to 90 minutes on average and appear as multiple, small, red hives that measure 2 to 3 mm. This type of hives is smaller in appearance than classic hives. Stress hives generally appear on the arms and upper trunk but can also appear on the thighs and neck. 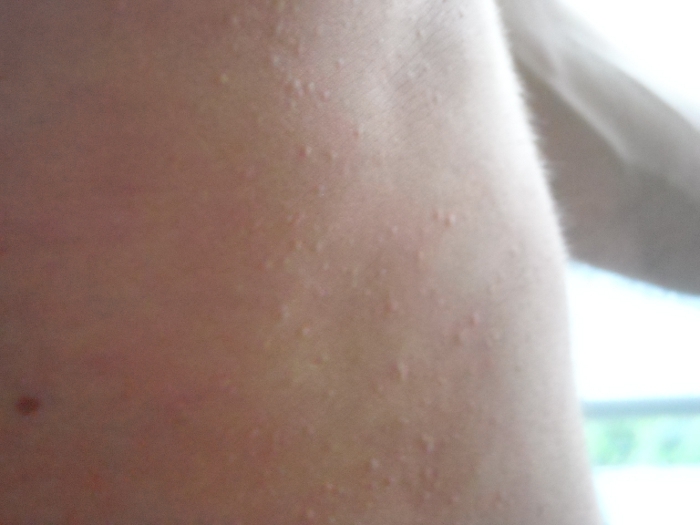 Physical – This type of hives is the most common type of chronic hives. Physical urticaria also goes by the name dermographism or dermagraphism. This type of hives appears on the skin in the form of welts or weals that are the result of firm stroking, scratching, or itching of the skin. The skin reaction becomes apparent very quickly, usually after the itching starts. The welts normally disappear within 30 minutes. Some call this physical form of hives skin writing. Approximately 5% of the people who have hives have this form. The cause of physical hives is unknown in most cases, but it can be caused by antibiotic therapy, emotional onset, and viral infection. Cold – This type of hives comes from exposing the skin to extreme cold. Specifically, people get cold urticaria in the areas of their skin exposed to damp, windy, cold conditions. The cold type of hives comes in two forms. The most common form occurs on the face, hands, and neck upon exposure to cold temperatures and the onset is rapid. This form of cold hives can last 5 to 6 years. The other form is hereditary. Although this form is rare, it can cover the entire body within 9 to 18 hours of cold exposure. Those who suffer from cold hives may also suffer from stress or physical hives. Pressure– This type of hives happens after the skin sustains pressure or it may occur as a delayed response to pressure. 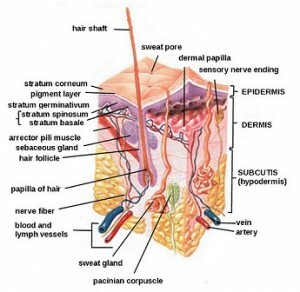 The delayed form occurs after six hours of applying pressure to the skin. This form of hives is slightly different from most forms of hives. The affected area is more spread out, and the hives can last from 8 hours to 3 days. The cause of this type of hives comes from skin pressure caused by belts, hard surfaces, tight clothing straps, standing, leaning against objects, tight clothing, etc. The hands, trunk, buttocks, face, legs, and feet are the most commonly affected areas. The swelling lasts longer and does not become visible quickly with pressure hives. This is not to be confused with a type of reaction known as dermatographism. Heat – Continuously applying heat to the skin can cause this type of heat hives. Although this type of hives is rare, it begins to occur within 2 to 5 minutes of heat exposure. The episode of hives does not last longer than one hour in most cases. Water– People who have this type of hives are affected upon contact with water (aquagenic urticaria). This form of hives is rare, and the onset resembles the appearance of stress hives. Within 1 to 15 minutes of exposure to water, the hives appear. The onset can least from 10 minutes to 2 hours. Histamine discharge does not seem to be the cause of water hives. It is believed that water additives such as chlorine are the actual cause of the sensitivity to skin. This form of hives is treated by administering a cream to the affected area. Solar-This form of hives is onset by exposure to sunlight. Within minutes, the areas of the skin exposed to the sun are covered in hives. The condition usually does not last longer than 24 hours. Once the skin is no longer exposed to sunlight, the conditions begin to improve within a few minutes or a few hours. There are 6 types of solar hives that exist. The wavelength of light is the determining factor of what type of solar urticaria people have. Glass protects those suffering from solar hives because it absorbs the wavelengths of the sun. Exercise-Induced Anaphylaxis – This type of hives was discovered a few decades ago, and it becomes apparent after a few minutes of exercise. Those who have this type of hives will experience itching, hives, low blood pressure, and shortness of breath within 5 to 30 minutes of exercising. The symptoms have been known to cause shock and death in some individuals. Exercise-Induced hives is most commonly caused by jogging. Unlike stress hives, people do not get exercised induced hives from fevers, hot baths, or warm showers. Vibratory Angioedema – This painful form of hives occurs after coming in contact with vibration. Although this type of hives is rare, the onset is within 2 to 5 minutes of making contact with vibration. Within one hour, the hives are no longer visible. This type of hives causes speedy swelling of the area that encounters vibration. Quite a few symptoms come with hives. The most common symptoms are swelling and itching of the skin. Those suffering from hives will notice skin colored welts or raised welts on the skin. The wheals or welts can last from a few hours to a few weeks, and they may appear and disappear very quickly on the skin. The number and the size of the hives may change very quickly. The boarders of hives are usually well defined, but they can come in many shapes. The raised skin of hives is red in color, and when pressing against the skin, it will turn white in color. Hives can be the result of serious allergic reactions, but this is not the case in most situations. Hives are not associated with organ diseases, and they only appear on the skin of an individual. Hives may cause life-threatening reactions that need immediate medical attention. People who experience fainting, problems breathing, or swelling of the tongue or face should seek medical attention immediately. Hives can appear on any part of the body, depending of the type of hives that each individual suffers. Allergic and non-allergic triggers can be the cause of these skin welts. In some cases, stroking the skin can be the trigger of hives. Acute hives are easier to treat than chronic hives. Even with all of the treatment methods available, there is not treatment that is guaranteed to work for those suffering from hives outbreaks. There are no specific treatment options that can control all hives outbreaks. Even certain medications can become resistant and lose effectiveness over time, causing individuals to try new medications to control their outbreaks. Many hives outbreaks clear up quickly without any treatment. It is also very hard to determine if treatment options work since certain medications take a day or so to build their effectiveness. It is important that each individual who has hives identify their triggers. This can be difficult in some cases because many people display more than one type of hives and there are various forms of the condition. Some types of hives may exhibit no symptoms so it may be very hard to pinpoint the trigger. Individuals may be able to manage exposure to trigger if they can determine the trigger. Antihistamines are common treatments for hives. Drugs such as hydroxyzine, fexofenadine, and cetirizine are used to treat hives. These drugs are used to halt or prevent hives attacks. Some forms of hives are triggered by stress in individuals. Stress management can be an effect treatment option for those suffering from this type of hives. Stress management can lessen the occurrences and severity of outbreaks. Treatment options similar to those used during psychological pain management may also be instrumental in shifting an individual’s focus away from itching and discomfort during a hives outbreak. Severe hives outbreaks can be treated with oral corticosteroids. Doctors may prescribe a drug such as Prednisone. Other drugs such as Dexepine and other tricyclic antidepressants can be used as therapy. These treatment options are controversial because these drugs have extreme side effects. Doctors do not recommend that hives suffers use these drugs on a long-term basis. Doctors can also administer steroids into the muscles of individuals suffering from anaphylactic hives. Clinical trials are being conducted using afamelanotide (formerly CUV1647), an alpha-melanocyte-stimulating hormone, to treat solar hives. Acute forms of hives can be treated with topical cream. These creams–which include Desonate, Hydrocortisone, and Fluocinonide –help individuals manage the itching caused by hives outbreaks. Hives take many forms and a large segment of the population may be affected by them at some point in their lives. It is possible to treat hives, although most cases clear up without the use of treatment. Identifying the trigger of hives is one of the best ways to prevent future outbreaks. Although treatment options can help the symptoms of hives, they may not prevent future outbreaks.